It’s just not practical for most in-house IT organizations to keep up with the latest industry trends and technologies, and all the skills they require. At HiTechnique our exceptional team of Spokane IT Professionals has both the technical know-how and the real-world experience to tackle any IT challenge. We are the most certified staff around, with credentials in Microsoft, Hewlett-Packard, Citrix, VMware and security. But even a technical mastermind falls short if he or she is too caught up in computer jargon. That’s why we also make sure our experts have the communications skills necessary to help guide clients through the most complex technical issues. But before we make a single recommendation, we get to know you and your organization. Armed with a thorough understanding of your specific situation, we employ a consultative approach to ensure you have the right technology in place to support your business goals. 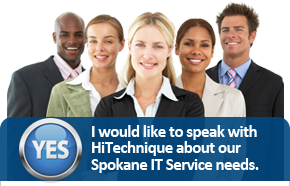 Experience HiTechnique today, your team of trusted Spokane IT professionals are standing by ready to serve you. Call us today to book your no obligation review of your business network and computer support needs.